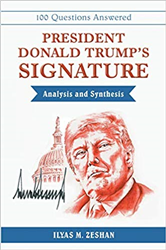 Ilyas M. Zeshan explains the fundamentals and science of handwriting analysis — and what Donald Trump’s signature reveals about his character in the new book, “President Donald Trump’s Signature Analysis and Synthesis” (published by Archway Publishing). Written in a question and answer format, Zeshan presents a detailed analysis of the president’s signature with precise explanations and elaborations. The author examines Trump’s signature to describe how the president perceives himself, how he perceives others, how he gauges various issues and situations and much more. In total, Zeshan provides answers to 100 questions he received about the president’s signature prior to and after Trump’s election. The author also includes a pictorial dictionary in the book for readers to learn more about themselves as well as others. The book is available for purchase at: https://www.amazon.com/President-Donald-Signature-Analysis-Synthesis/dp/1480870773. Ilyas M. Zeshan earned a master’s degree in international relations from Chicago’s Roosevelt University and continued his studies there for a Master of Business Administration. His professional experience includes work as a writer on international relations, a graphology instructor and as a graphologist who has given advice on thousands of handwriting samples. He is the inventor of handwriting analysis in Arabic, Urdu, and Persian; he also wrote an extensive book on these subjects. He has appeared on numerous radio and television programs and resides in the suburbs of Washington, D.C.